At For Goodness Cakes we believe that the inside is just as important as the outside, so we put a great deal of thought, energy and time into the ingredients, menu options, and baking process. 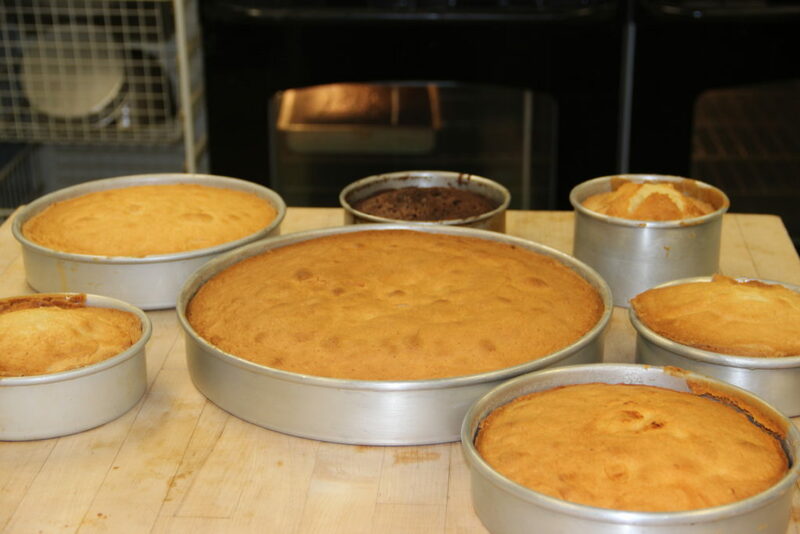 All cakes and fillings are made fresh, from scratch (except for Swiss imported fruit preserves) each week. 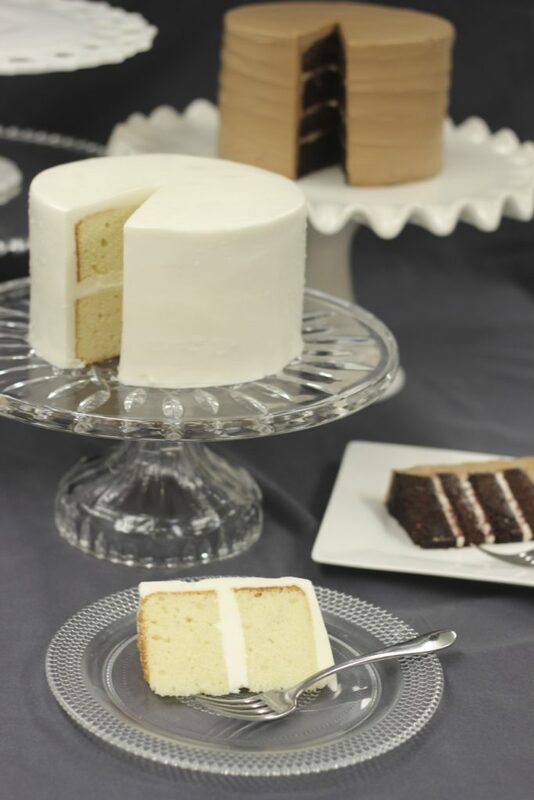 Our signature white cake is derived from a sour cream pound cake, a lighter version but still rich with butter, sugar and pure extracts, which keeps it moist and flavorful for many days. This batter is used to create an array of different flavors from simple vanilla to our popular chocolate chip to orange Grand Marnier, and can be adapted to create your own unique creation if the extensive menu does not already include the cake flavor of your dreams. Chocolate, red velvet, and “the best carrot cake you’ll ever have” are also among the most popular of our cake offerings. 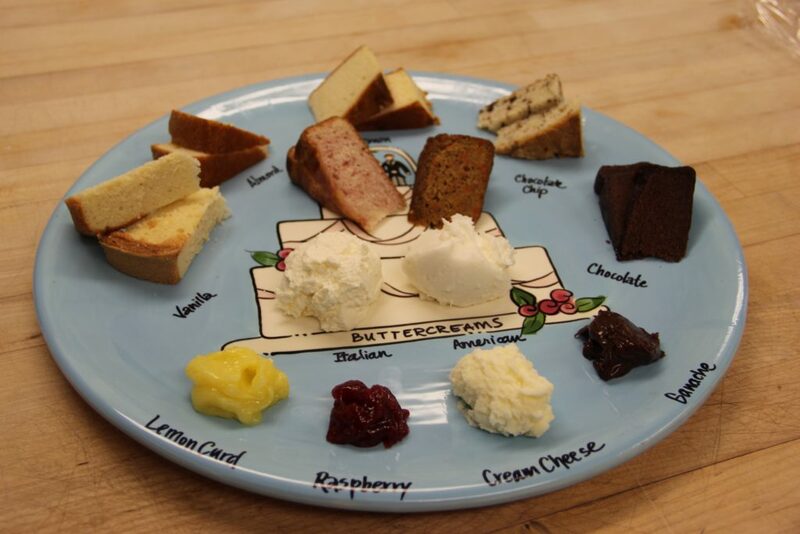 The list of fillings ranges from our famous raspberry cream cheese to decadent chocolate ganache. The menu is always evolving since pastry chef, Haines Barksdale, loves tinkering around in The Bakement to come up with new creations. For Goodness Cakes is best known for our unique approach to cake icings. We specialize in smooth buttercream icing and creative buttercream design techniques to achieve both the look and the taste you want. Most people prefer the softer texture and melt-in-your-mouth appeal that buttercream has over fondant. Although some designs require fondant icing, we always try to use buttercream when at all possible, even though it often requires more time and skill. What sets For Goodness Cakes apart from other bakeries is the option of two very different, but equally popular, buttercreams. American buttercream, a Southern specialty, made with butter and powdered sugar, is great for those who love icing and whose motto is “the sweeter, the better.” Italian meringue buttercream, made with whipped egg whites, cooked sugar and butter, is paired perfectly with our richer cakes and a wonderful choice for those who prefer something less sweet. Most designs can be created using either buttercream icing. Can’t decide? We can use both! Fondant is still a very useful medium for design techniques and can be used in small amounts to create beautiful designs. If you want a porcelain smooth finish or certain designs that only fondant icing can create, it’s a great choice (just sugar!) and actually not all bad. Come and taste for yourself!